The Which Greek Island Kefalonia beach guide offers an in depth look at some of the best beaches in Kefalonia. The main tourist beaches are unsuprisingly based around the tourist resorts, those being Makris Gialos and Platis Gialos which are both close to Lassi as well as Skala beach and Lourdas. All of these beaches have great facilities and if you just want to spend a few hours at the beach, maybe try some water sports or simply top up your tan on the loungers whilst sipping a cold Mythos then these would be the perfect tourist beaches for you. If you want to get away from the crowds of the above beaches then why not check out Koroni or Kaminia (Mounda). Both are found on the south west corner of Kefalonia island, both are easily comutable from Skala and both are free from the mass crowds. This ones easy, go and soak in the views at Myrtos, easily one of the most photogenic beaches in Greece with it’s white pebbles and stunning turquoise waters you’re sure to love it. Another option is Foki, it’s another pebble beach but this ones surrounded by Olive trees giving a wonderful sense of isolation. Foki is up in the north of Kefalonia so a great option is to combine it with a visit to Fiskardo. This is where Kefalonia excels, there’s a wealth of good sandy beaches, the best of which are on the west coast, with the most popular ones been found at Lassi, Skala and Lourdas with quieter ones dotted about in between. For those that don’t like getting covered in sand or simply prefer a pebble beach there are a number of good options and they are all around the north or north east of the island. Firstly, there’s the obvious choice of Myrtos. There’s also the huge Antisamos and tiny beaches of Foki or Assos. 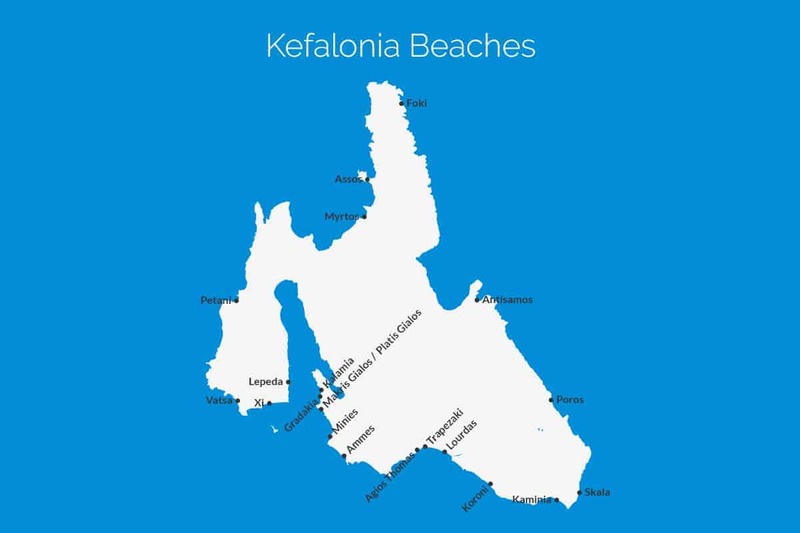 Our full Kefalonia beach guide below shows all 20 of the main beaches on the island, including those mentioned above. If you already have an idea of the beaches you want to visit then you can click on the headings and be taken to a page that gives you the details about that beach, alternatively use the filters to get a list of beaches that would be ideal for your needs. Agios Thomas is a small sandy beach on the south coast of Kefalonia. It’s not one of the main popular beaches on the island but as it’s so small it does feel a bit crowded, particularly at peak times in the summer. There’s a couple of tavernas at the top of the pathway where you can get food and drink but there’s no water sports. Ammes beach is in the south western part of Kefalonia, in the Svoronata area, right at the end of the airport runway. The beach has soft golden sand and is backed with some large rocks, the sand slopes steeply before getting to the water line but then remains shallow for some distance out making it good for youngsters. Antisamos beach is close to the resort of Sami on Kefalonias east coast it’s a pebble beach that has loungers out the front of the two tavernas. There are water sports including jetskis, banana boats, pedalos, canoeing, water skiing and many more which is great if you need to keep teenagers or those that are easily bored entertained. Assos is a small bay with two beaches, a larger one with loungers and a smaller one without. The larger beach has taverans and shops running along the shore line where you can get drinks and snacks as well as a fresh meal. Assos beach is easily accessible by car and there is an area that’s used as a car park just past the smaller beach. Foki beach is a beautiful inlet just south of Fiskardo in Kefalonia, due to it’s location close to Fiskardo it is often called Foki Fiskardi Beach. It’s a small beach with white pebbles surrounded by olive trees, there are no sun loungers and the only taverna is not on the beach itself. The olive trees to the rear offer some natural shade. Gradakia Beach is a small rocky inlet which is found at the northern end of the Lassi strip. It’s easy to walk there from anywhere in Lassi and even Argostoli which would take about 30 minutes. Although Gradakia is a small beach it still crams in 3 rows of sun loungers which, when fully occupied makes the beach feel quite crowded. Kalamia beach is a beautiful quiet cove and the most northerly of the Lassi beaches along the Fanari road. It never gets too busy and is usually very peaceful, facilities include sun beds with umbrellas and a small bar for drinks, snacks and lunch, there’s a shower to refresh at the end of your visit but no toilets or water sports. Kaminia beach, which is also known as Mounda Beach,is long, sandy and perfect for swimming, walking or sunbathing. It’s good for families with young kids as the sand slopes gently into the sea, you can get out over 50m and still be able to touch the bottom so it’s really safe for youngsters to play in the shallows. Koroni beach is a gorgeous sandy cove that lies around the bay of Mounda in Kefalonia, not far from the resort of Skala. Koroni beach is surrounded by steep cliffs and lush vegetation. With the cliffs blocking easy access to the beach, you have to take the difficult rocky road that takes you down to the beach, it’s easiest on a quad bike. Lourdas beach, otherwise known as Lourdata beach is one of the largest bays in Kefalonia and stretches over 2km, it has course sand and shingle. Lourdas bay is backed by Mount Aenos which gives it some of the most amazing scenery of any beach in Kefalonia. The beach itself has everything you need including tavernas and loungers. Makris Gialos beach is a short walk from the main road in Lassi. Being close to one of the most popular tourist resorts, the shallow waters, golden sand and excellent facilities including a massive amount of sun loungers and water sports make it a very popular beach, attracting groups of all ages including families. Minies beach, sometimes also known as Minia beach is a natural sandy beach found on the west coast of Kefalonia close to the northern end of the airport. Minies beach is ideal for children due to the soft golden sand that’s great for digging or building sand castles and the shallow clear water that’s perfect for kids to paddle in. Myrtos beach is that stunning picture post card beach that you’ve seen photographed from the winding roads above dozens of times and probably part of the reason why so many people go to Kefalonia. Myrtos beach is found on the west coast up towards the north of the island, it’s accessed via a steep, winding road and is well signposted. Petani Beach is a sandy bay with pebbles around the shore line. It’s located on the west cost of Kefalonia, just north of Lixouri. It has a good number of sun loungers available to hire but is not completely covered in loungers, they are mainly clustered around the beach side tavernas but there’s open space available away from the tavernas. Platis Gialos beach is a continuation of Makris Gialos beach. It’s less than a kilometre from Lassi and is a fantastic sandy beach. Platis Gialos is set in a gorgeous bay, surrounded by pine trees, sheer rock faces and vegetation, it has beautiful soft golden sand and transparent water. You’ll find a beach bar, showers and sun loungers. Poros beach is a calm and pretty bay on the east coast, on the edge of Poros village. Poros beach is narrow and although normally not too bad it can feel busy at peak times, it has crystal clear waters and is made up of pebbles and shingle. There are sun loungers with umbrellas available as well as sections of the beach that are left clear. Skala is a massive beach that is both long and deep, it’s surrounded by Pine trees and is mainly sand and shingle. There are a few tavernas along this stretch of coast to get food and drink during the long days spent taking in the gorgeous weather. Water sports are available on Skala beach meaning you can keep teens happy too. Trapezaki beach is a narrow sand beach roughly half way between Argostoli and Skala on the south west coast of Kefalonia. Getting to Trapezaki beach is simple as there’s a good tarmac road that leads down to a small car park, there is a single taverna which has toilets and serves food and drinks as well as playing chill out style music. Vatsa beach is a large sandy bay on the south coast of the Paliki peninsular, on the beach you’ll find a wooden shack style taverna with sand floor that’s the perfect setting for a relaxed meal and a couple of drinks, there’s a few sun loungers to use and some shelters made from driftwood that gives the beach a unique rustic feel. Xi beach is a popular stretch of coast just a few kilometers south of Lixouri on the south coast of the Paliki peninsular. Xi beach has soft red sand and plenty of water sports, beach side bars with great facilities including luxury loungers and umbrellas. On the main part of the beach there’s a few rows of basic loungers where it gets quite busy. We want Which Greek Island to be as accurate and informative as possible, so, if you notice anything wrong with the Kefalonia beaches guide or any other page please let us know. We’re also on the lookout for great photos to show people what the places we’re describing are like. If you have photos from any of the beaches in Kefalonia or from any of other island on the site then we’d love to see them, simply click the button below to go to the photo upload page. Thanks.